Stage 15 might offer up a rare treat for some of the riders in the peloton, a bunch kick possibly on the cards for the fast finishing sprinters, having had to endure a Pyrenean onslaught and several summit finishes thus far. The final day’s ride around the Champs Élysées considered the only nailed on gallop remaining for Mark Cavendish et al. A 183km course takes the peloton from yesterday’s finish in Mende to the town of Valence, consisting of an opening 73km of upwards terrain encompassing two categorised climbs and a long descent down to the intermediate sprint; before a Category 2 ascent stands between the sprinters and their possible bunch kick. Opening with close to 20km of uphill, some will be feeling the pain right from the off after the preceding fourteen days in the saddle; notching up the Category 3 Côte de Badaroux (4.6km, avg 5.1%) after 9.5km. After this the road lulls somewhat before entering onto the Category 4 pairing of the Col du Bez (2.6km, avg 4.4%) and Col de la Croix de Bauzon (1.3km avg 6.2%), dovetailing neatly together in less than 5km of riding. A long descent follows on from this doubleheader and does not really stop until after the intermediate sprint at 108km as the road tilts upwards ahead of the day’s biggest climb. Col de l’Escrinet is a Category 2 ascent totalling 7.9km from bottom to top, averaging a grinding 5.8% gradient for its entirety. It is relatively constant throughout however and avoids fluctuating too wildly in regards to gradient, hopefully allowing the bunch to pace their way up to the top in order to stay fresh for any subsequent chase to the line. The descent down the other side of the climb lasts for around 25km and is likely to form the main tactical turning point of Stage 15. Any breakaway remaining by this point will need to be functioning extremely well to hold off the peloton and bolster enough numbers to maintain the pace to the finish; infighting upon the Col de l’Escrinet could spell disaster for any move’s chances. A series of roundabouts comprise the final 4km and also includes a gentle rise which levels out totally as they approach the line; the dynamic between escapees and sprinter’s teams will make for intriguing viewing during the decisive run down the Col de l’Escrinet. Le Tour has a high chance of finally witnessing a victory by Peter Sagan thanks to the profile and nature of Stage 15’s run from Mende to Valence. He displayed his prowess once again in yesterday’s stage in joining the break and has the option to do the same today or stay hidden within the bunch in anticipation of a possible bunch kick. The moderately technical approach in the final 5km combined with the drag to the short finishing straight suits Sagan particularly well and he will be focused on featuring here. As ever, he will lack team support from Tinkoff-Saxo, but that has not stopped him from accumulating 322 points in the Green Jersey competition thus far. Of similar talents and attributes is the German sprinter John Degenkolb, an underrated climber who should be able to cope with the ascents of the day and participate in any remaining bunch sprint. He should have a greater depth of support compared to that of Sagan and often benefits from a difficult day in the saddle which fatigues his rivals ahead of the finale. Other than a breakaway victory here, Degenkolb is most likely to be the man to put Sagan into second place yet again. The light build of Bryan Coquard should aid the Frenchman greatly during the climb of Col de l’Escrinet and could be one of the freshest sprinters remaining come the end of day. 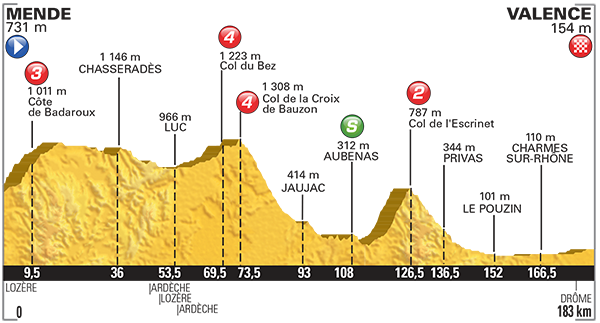 With a short gallop to the line and a slight drag during the final 3km, Coquard could feature here despite a possible lack of support and a technical run in which might expose his positional weaknesses. Greg Van Avermaet has options as ever to join a break or wait for the chance of a reduced sprint in Valence; though he is probably still on a high from his Stage 13 victory to worry a great deal. A hard race could see him rise to the top yet again, though a breakaway might be his best chance of stage honours once more at 2015’s Tour de France. Few riders will be eager to ride right the way to the line with Avermaet in such flying form, meaning his efforts to make the break could prove fruitless, but he remains a danger in any sprint contesting the win regardless. It would be foolish to discount Mark Cavendish from featuring in the mix on Stage 15 simply due to the presence of the Col de l’Escrinet and its summit almost 60km from home. Muck like Degenkolb, his climbing skills are greatly underrated and he is possibly in fact the best climber from this race’s selection of pure sprinters. He usually manages the attrition rate reasonably well between the Alps and Paris, suggesting his form might be better here than expected. Etixx-QuickStep will not struggle to support the Brit should they believe he has what it takes to win today and that level of backing could prove decisive coming off the back of the Col de l’Escrinet. A breakaway has a high chance of succeeding on the road to Valence, moves at this stage of Le Tour are often bolstered in size due to teams’ diminishing chances of making their presence here worthwhile and can benefit from a lack of chasing impetus behind due to fatigue. Sylvain Chavanel, Lieuwe Westra and Ramunas Navardauskas are three such riders who could place themselves within the breakaway, while also possessing the necessary expertise to finish the job at the end of the day. Posted on July 19, 2015 by Spokenforks	This entry was posted in Le Tour de France, News and tagged 2015, Bryan Coquard, Greg Van Avermaet, John Degenkolb, Lieuwe Westra, Mark Cavendish, Peter Sagan, Preview, Ramunas Navardauskas, Spokenforks, Stage 15, Sylvain Cavendish, Tour De France. Bookmark the permalink.